Ohio Senator Bob Peterson (R-Washington Court House) stands with Ohio Librarian of the Year Debbie Saunders of Bossard Memorial Library. 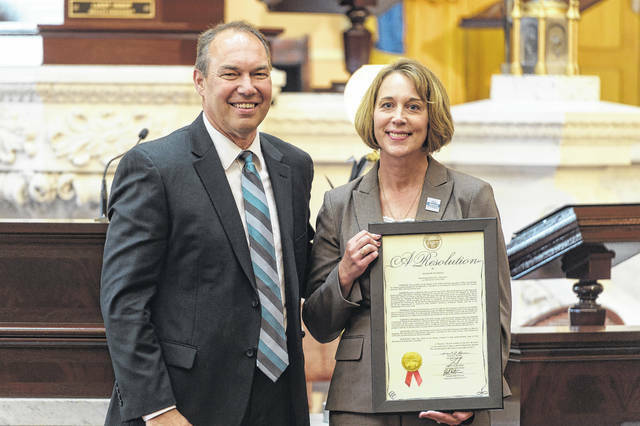 COLUMBUS — State Senator Bob Peterson (R-Washington Court House) honored Deborah Saunders of Gallipolis Thursday who was named Ohio’s 2017 Librarian of the Year previously in the year. Senator Peterson presented the resolution during a special recognition ceremony at the Ohio Statehouse. Saunders serves as director of the Dr. Samuel Bossard Memorial Library and was recently named the Ohio Librarian of the Year by the Ohio Library Council. Among the many innovative programs initiated under her leadership is the “Wi-Fi To Go” program that has helped deliver internet service to hundreds of rural homes. The Ohio Library Council (OLC) continues its tradition of honoring what it deems as the best and brightest individuals and organizations in the Ohio public library community. The organization in a written statement said it feels its 2017 honorees have demonstrated outstanding leadership and remarkable dedication to providing the best possible library service. They were recognized at the Awards and Honors Luncheon on Oct. 4 at the OLC ’s Convention and Expo in Dayton. The OLC further said in March 2017, Saunders testified before the Ohio General Assembly about her library’s role in helping people find jobs, especially in an area of the state hit hard by the recession. Through these programs, Saunders has provided educational and cultural opportunities that many in the southeast would not have experienced otherwise, due to geographic and economic barriers. The OLC feels Saunders’ accomplishments illustrate how a library can have a positive and lasting impact on the community. On Aug. 3, Ohio Governor John Kasich appointed Saunders to his Executive Workforce Board which is charged with identifying ways to prepare and continuously retrain Ohioans of all ages.